Spring break is at our doorstep, or right around the corner for some of us. For plenty of spring break fun, look no further than Park City. This town is jam packed with spring activities. True, spring weather can bring its challenges, however, with a little research and planning you can have an excellent break that you will remember for years. While skiing and music might already be on your list, round out your activities by getting some fresh air and experiencing what makes Park City so unique. 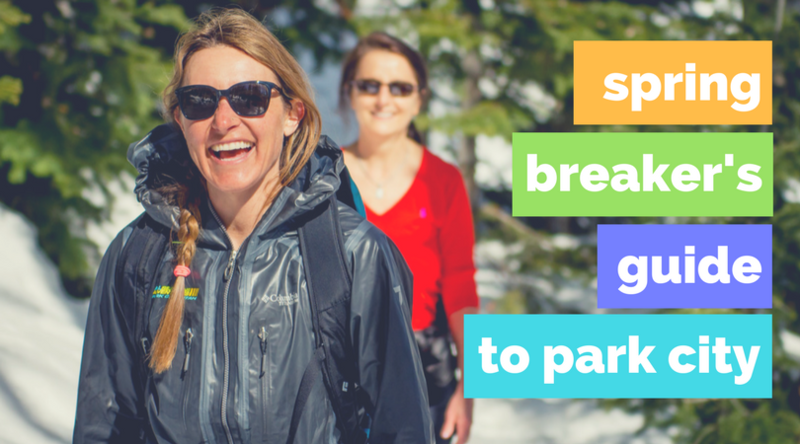 To help you decide which activity is best, and how not to waste precious spring break time, we have put together the spring breaker’s guide to Park City. Fly fishing in the winter or early Spring might not interest you at first. But with the proper gear and know-how — like with a fishing guide — it can be a very enjoyable time to be on the water. It’s true, fish do have different habits in the winter, but with a knowledgeable guide this can work to your advantage. Proper attire is key to enjoying your day so make sure to layer up before you go. If it’s great views that you crave you might want to try a snowshoe tour. Our Snowshoe and S’mores tour is very popular with families and includes a short “stomp” around lower Deer Valley. The tour ends at a welcoming fire pit. Without a doubt, we take our s’mores seriously and use only handmade “from scratch” marshmallows and graham crackers. This tour is perfect for the young ones, get them snowshoeing for the 1st time and s’mores over an open fire! Put a real bang in your spring break with a session of Trap Shooting. With a range just 20 minutes from Park City this activity will make your break very memorable. Trap shooting is fun with groups and families as a degree of friendly competition is encouraged. Obviously, Park City has plenty of skiing opportunities, even in the spring. But, did you know that you can ski with a medal-winning Olympian? Ski with one of six champion snow sports athletes for a half-day or a full-day at Deer Valley. This unique opportunity books up quickly during spring break so check the website to make your reservation. We heard rumors that the après ski scene at Deer Valley would be heating up this year. Those rumors are proving to be correct. They are featuring live music at the EBS Lounge Thursday to Sunday from 3:00 to 6:00 p.m. What’s more, they’re also having a Sunday spring celebration featuring live entertainment and complimentary cookies and hot chocolate. Check out the website for details and dates. If you crave more music you might just have to ski to it. The Canyons’ Red Pine Lodge offers concerts on Saturdays starting at 1:00 pm and there is oftentimes a live musician in the Cloud Dine Lodge, also on the weekends. Beyond that, be sure to check out Mountain Town Music and Park City Live Music for lineups. Park City’s local wine school has plenty of opportunities to expand your wine knowledge. The Weekend Wine Series lasts one hour. This educational happy hours leaves no student behind. The Wines and Mines tour gives you some history with each sip. Also, the A Table for 12 program is available through April and includes a 75 minute food and wine paring for 12 people. Keep your eye on the spring break count down. The week will be here before you know it!